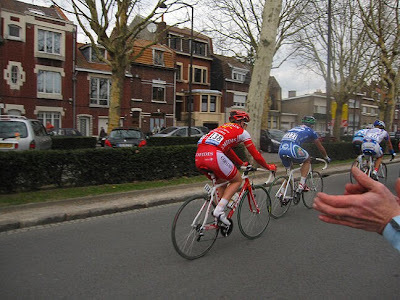 Our correspondent Lucho at the Cycling Inquisition blog sent along the photo below of the final rider on the road for the Queen of the Classics, Paris-Roubaix. "I was sad to see that a few French and Belgian fans were mocking and taunting these stragglers as they went by, often covered in blood and with ripped clothing. So much for the "great European fans" that we often hear about. I stood there and cheered them all on. 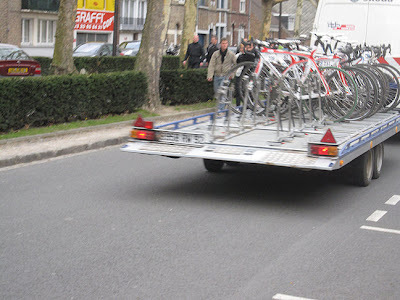 Watching them go by was actually more exciting than seeing Cancellara go by. There was a quiet beauty about seeing them go in after the crowds dispersed and the barriers were already being taken down." The rider is Romain Zingle of Cofidis (who was not listed in the results due to not making the cutoff). Of official finishers, 72nd was Yauheni Hutarovich for Francaise de Jeux, the 2009 Tour de France Lanterne Rouge. Final official finisher was 74th, Jos Van Emden for Rabobank. The race report at Cycling Inquisition is well worth reading by any cycling fan.